Kevin Spacey's Tonys opening number surprises Broadway fans by being, well, good. No one was expecting Kevin Spacey to host the Tony Awards this year (or any year), but host he did. In Spacey's opening number, he proved a full command of the Broadway geek — no shade — lingo we all expect from someone in command of the Great White Way's evening of the year. Oh, and he tap danced. 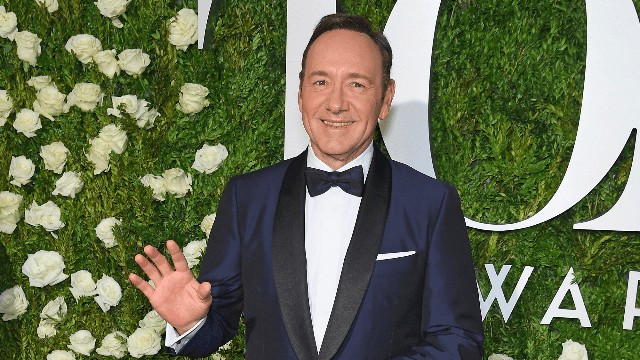 As the New York Times reports, just because Kevin Spacey isn't a typical Broadway actor doesn't mean he shies away from a good ol' fashioned song and dancer number. Aside from his opening song this evening, Spacey is also expected to close the show alongside Ms. Patti LuPone herself. Spacey came out in full Evan Hansen regalia. Fun opening by Kevin Spacey, who, contrary to his lyrics, actually has a lot riding on tonight: Emmy nom voting starts in the morning! And, yes, Whoopi Goldberg was there. Watch the full opening number here.